I vaguely remember the feeling that the magazine addict in me felt upon learning that my monthly collection of glossy mags would include a magazine just for Latinas. I never cared much about the face that graced my magazine’s covers, it was the content listed on said cover that was the attraction. Latina-relevant stories, articles, recipes, and more? How could I possibly resist? I just did a quick search, and that was in 1996 and 17 years later, I can say that in reality, a Latina magazine didn’t really add anything to my life that the other magazines didn’t. Add to that the fact that with very little in content that mattered to me, I began to take notice of the cover models and realized that it was basically the same approximately 10 Latina celebrities on rotation, so I let my subscription lapse. Even with all of that, my faith and hope that the magazine could provide something different remained. I continued to call myself a fan, and kept up by buying an occasional issue at the newsstand and reading online. There it was, on my Facebook news feed, a link to an ‘article’ titled Selena and Justin and 9 Other Adorable Celeb Couples on Instagram!, (and no, I did not add the exclamation mark, it was part of the linked title–see it here–though it doesn’t seem to be in the actual title). My initial thought upon seeing it was that one of my friends was sharing a link from Teen Beat, though to be honest, I don’t even know if that magazine still exists. 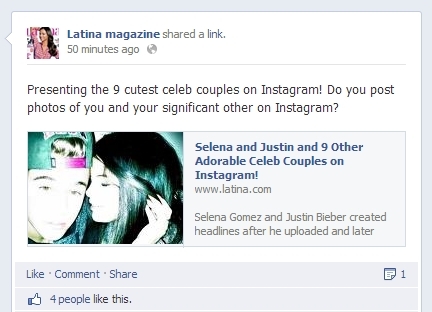 I followed the link, and went to Latina Magazine’s Facebook page. I decided to take a scroll, and there it was, the post that broke my heart: Reese Witherspoon’s Not Alone: 11 Latino Stars Who Have Been Arrested. I blinked. There was no possible way that I read that correctly. I read it again. Can’t be! I clicked on it, and there it was, a slideshow. The first face…Charlie Sheen’s. Still in disbelief I shared the link with a few friends, one who upon seeing the title refused to click on it. It was true, I wasn’t seeing things. Latina Magazine, or someone therein, decided that the best way to discuss the arrest of a non-Laino celebrity—was it really necessary to discuss the arrest of a non-Latino celebrity?— was to shine the spotlight on 11 Latinos who had earned the honor of a mugshot. I wasn’t sure how to feel about it, or what to do, I just knew that I couldn’t leave it alone. 1. The orange jumpsuit: Who wore it best? A bright color and an unforgiving cut won’t flatter every celebrity arrestee. Let’s do side by side comparisons and vote on who pulled off the orange jumpsuit look best. We’re already judging them for the arrest, why not also their physical appearance? In fact, let Joan Rivers and the rest of the fashion police weigh in. Get it? The Fashion Police!! Your readers won’t have access to their hair styling tools, and leaving their hair down and loose puts them in potentially hazardous situation—jail cell fights. Hair pins come in handy for many reasons, show your readers just how many. Every celebrity buff loves to know that their lives aren’t that different from their favorite celeb’s. Whether grocery shopping, pumping their own gas, or getting arrested and screaming, “DO YOU KNOW WHO I AM?” at the police, stars are just like us. Well, except for that whole thing where their arrest record doesn’t keep them from finding work and living a normal life. But you know, just like us! I am normally of the opinion that Latino-relevant stories include anything that happens in the world because we Latinos live in the world, but Reese Witherspoon’s arrest isn’t one of those things. Neither her, nor any other celebrity’s, arrest is relevant to me as a human, let alone as a Latina. So how about we decide that rather than reaching so far to make “breaking news” connect, we just decide that some stories are best left untold. *Latina Magazine, you have a responsibility to your readers and the culture that you claim to represent. You can and must do better than desperate attempts to connect irrelevant dots and never-ending stories outing celebrities as Latinos. Previous postWhy would anyone want to look like Barbie? She’s so fake!